Cornbread is a staple in the South, and it is absolutely essential with bean dishes, black-eyed peas, greens and hearty stews. 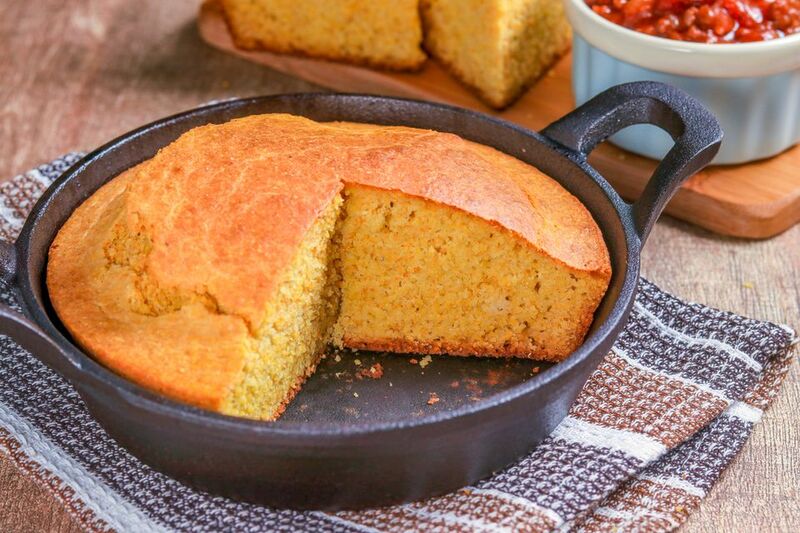 Hoe cakes, corn pone, spoon bread, hush puppies, corn sticks, muffins and corn dodgers are some of the many ways Southerners have enjoyed their cornbread through the years. Southern-style cornbread rarely contains sugar, though some regions and many people do like to sweeten their cornbread a bit. To add sugar or not can be a hot topic, and it's often the subject of discussion and debate on forums and in chats. And if you have Northerners and Southerners to cook for, you might have to look for compromise. Or make two pans! This cornbread is made with 3 eggs, making it a bit richer than most, and very tasty. The optional sugar may be omitted or replaced with honey or cane syrup. Put the oil or shortening in a 10-inch iron skillet and place in the oven to preheat while making the batter. In a mixing bowl, combine the cornmeal, flour, salt, baking powder, baking soda, and sugar, if using. In another bowl, whisk together the eggs, milk and butter. Combine with dry ingredients and stir until all ingredients are moistened. The batter will be similar to a thick pancake batter. Carefully, with heavy oven mitts, lift skillet out and turn to coat the bottom and sides with oil. Pour the cornbread batter into the skillet and return it to the oven. Bake for about 20 to 25 minutes, until browned. A toothpick inserted in the center should come out clean. Baking powder starts acting quickly, so have the skillet ready and the oven preheated before you combine the wet and dry ingredients. As soon as the batter is combined, pour it into the skillet and get it into the oven. This same recipe can be used to make cornbread muffins. The hot iron skillet makes for a crispy bottom and side crust; a greased 8-inch or 9-inch baking pan may be substituted. Dice 3 or 4 strips of bacon and cook it in the skillet. Use 1 tablespoon of bacon grease instead of the oil or shortening and replace some of the butter with the rest. Add the cooked diced bacon to the batter, if desired. Add 1 cup of well-drained cooked corn kernels to the batter. The salt may be reduced to 1 teaspoon. Brown about 1/2 pound of crumbled sausage in the skillet. Add the cornbread batter and bake. As soon as the cornbread comes out of the oven, run a knife around the edge to loosen and invert it onto a plate. Add 1 to 2 cups of Mexican-style cheese and green chile peppers for Tex-Mex flavor.